After showing suggestions for web search, image search and video search, Google started to autocomplete your queries in Google News. 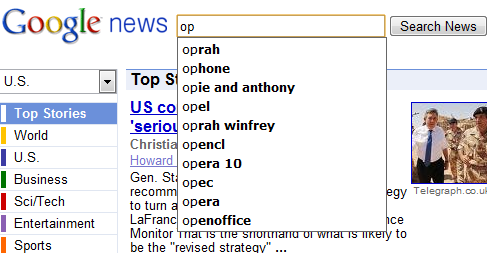 The suggestions are related to current news, so you don't have to type too many letters to find the latest stories about Opera 10, Walt Disney or Hurricane Jimena. The interface makes it difficult to select suggestions using a keyboard, since you have to press "Enter" twice to perform a search, but this bug will probably be fixed. Another problem is that you can't disable suggestions by visiting the preferences page and selecting "Do not provide query suggestions in the search box". This is a convenient feature on web search, image search and video search specially if you see that term that you are searching is also used by other people. I prefer having to double-tap the enter key. This way I can take what Google suggests and modify it easily using only a single enter key - if that makes sense. I like this feature but hate having to double click the Enter key after I select one of the suggestion. The first Enter key tap is to select the suggestion, the second tap is to search. Having to press enter twice is normal behavior for autocomplete fields in browsers. I'm with Brian on this one -- I prefer it. Actually, when I search the Web with google.com or IE8's search box, all I have to do is highlight a suggestion, using the down arrow key, and hit Enter one and I'm off to the site.